PICTURE EXHIBITION & INTRO STALL AT BHAWALPUR. May 2012 In Bahawalpur and its adjoining vicinities, Bahawalpur Working committee of Shaheed Foundation Pakistan arranged Pictorial Exhibitions of incidents. To introduce SFP among the momineens stalls were setup at several mosques during Friday prayers including locations; Markazi Jama Masjid at bhawalpur city, Markazi Imam Bargah at Khairpur Tamaywali, Hasilpur markazi imambargah, Masjid wa imambargah Ewan e Hussain a.s at Melsi and Haideri jamia Masjid Rahim yar Khan. Momineen showed keen interest and got performance report of SFP from the stalls. Imam e Juma�s made a special visit at SFP stalls. KARACHI : MARKAZ e ASAR SHOHADA PAKISTAN & MARAKAZ NIGHAIDAST FOR INJURED. On 26 February 2012, honorable wife of Shaheed Allama Arif Hussain Alhussaini laid the foundation stone of this project at New Rizvia Karachi. Construction work is expected to be started soon at this plot and construction plan has been designed. Arrangements are in process to keep safe the remnants of Shohada at Markaz e Asaar e Shohada Pakistan. Families of Shohada send many of the remnants of their Shohadas including in them many precious things. The martyrdom of Shohada revives in our minds from these remains of Shohada. Momineen are requested to donate in this project generously so that construction phase can be completed in its allocated time. One floor of this project has been dedicated for the Injured Momineen in incidents where they may rest for some time after getting released from hospital. DERA ISMAIL KHAN: Placement of beautiful stands on the graves of Shohada is in process. Till now Stands have been placed at more than 200 graves and will be placed soon on the rest of Shohadas graves. 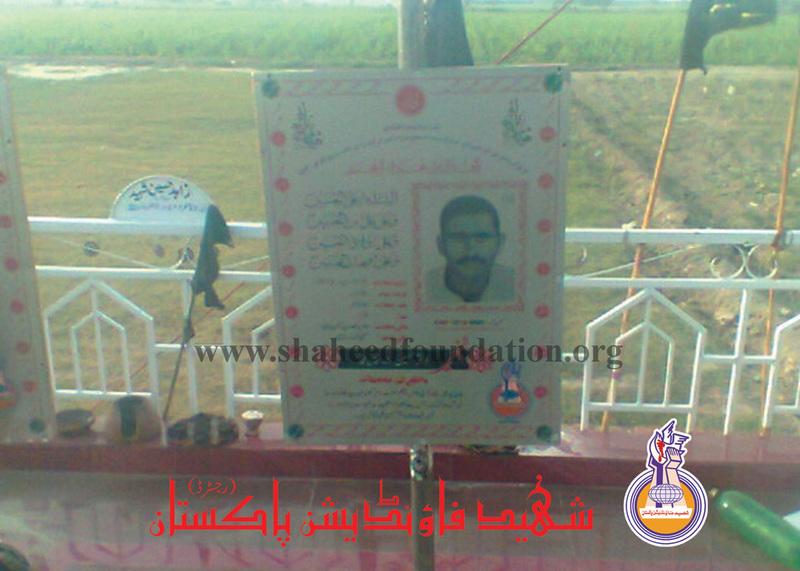 On these stands there is a picture of Shaheed along with some brief information. 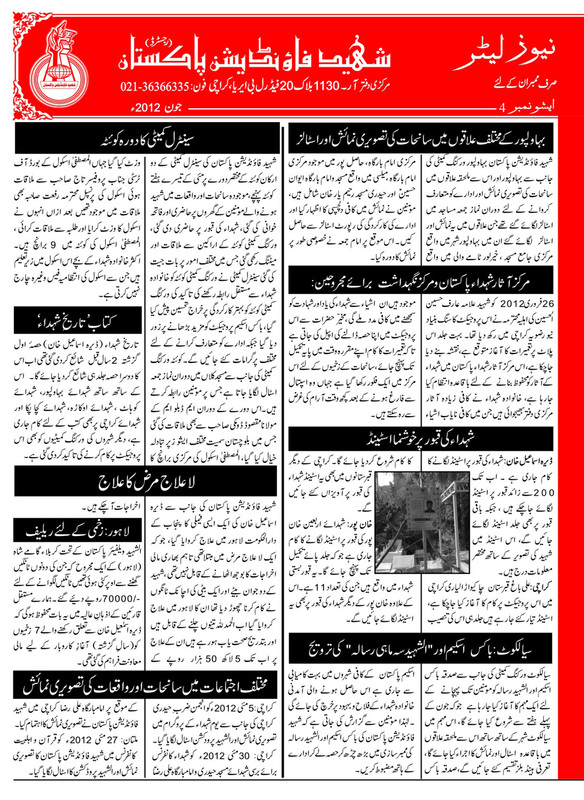 KARACHI: At Ali Bagh Graveyard, Chakiwara Lyari in Karachi this project has been started. Stands are being prepared and will be placed soon. Similarly, on other graveyards in Karachi, such stands will be placed at Shohada grave. 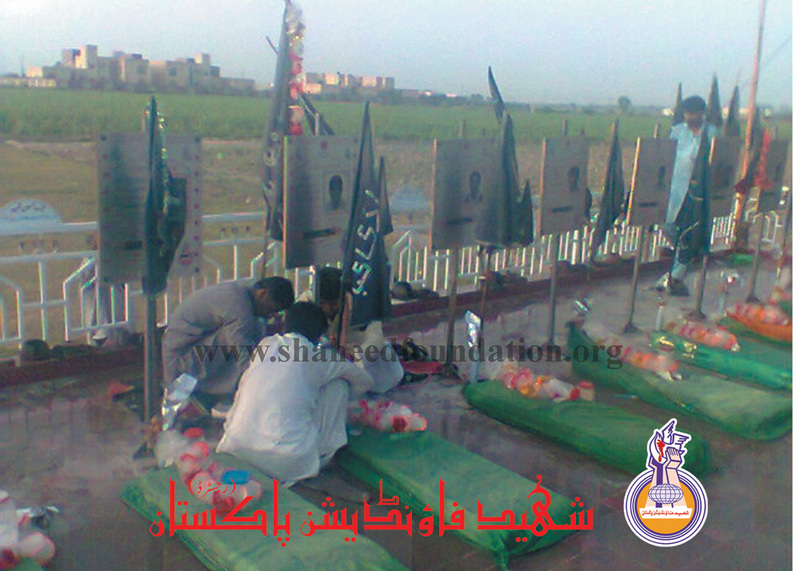 KHAN PUR: Stands are placing on the graves of Shohada e Arbaeen at basti shohada khanpur. 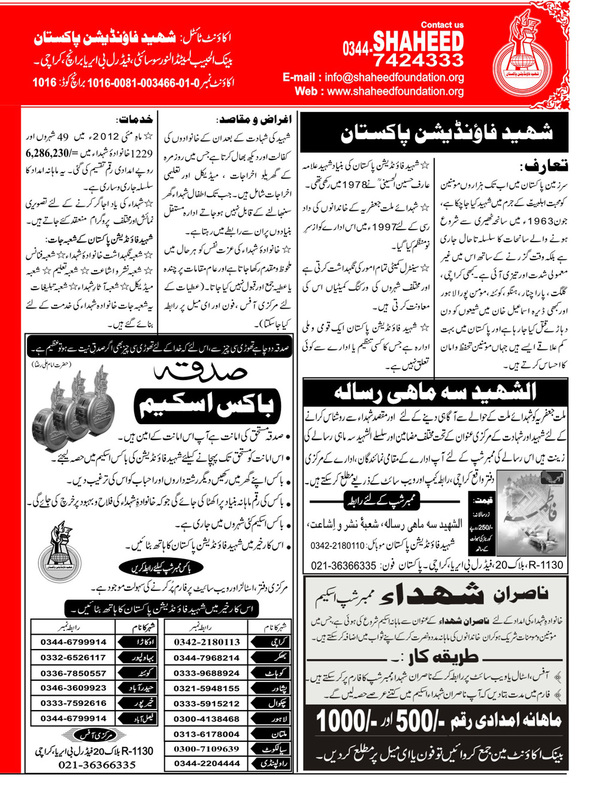 A program of distributing Sadqa Box & Al-Shaheed Magazine among Momineen is being initiated by Sialkot Working Committee that will commence from first week of June. In this program, besides Sialkot city, stalls and exhibitions will be displayed in the adjoining areas and introductory handbills will be distributed. Sadqa Box Scheme is running successfully in many cities of Pakistan and its collection will be spent for the welfare of families of Shohada. In this regard, all Momineen are requested to participate and donate generously in Shaheed Foundation�s Box Scheme & Al-Shaheed magazine to strengthen the organization. QUETTA: CENTRAL COMMITTEE VISIT QUETTA. In the third week of May, SFP Central Committee�s two members visited Quetta. They visited the families of Shohadas who attained martyrdom in recent incidents, did fateha Khwani and visited the graves of Shohada. A meeting with Quetta Working Committee was arranged in which different activities came under discussion. Central Committee advised Quetta Working Committee members to keep close correspondence with the families of Shohadas and appreciated over their excellent performance. C.C emphasized that Box Scheme Project should be promoted with more extent where as to introduce SFP among Momineen different programs will be carried out. A stall at Masjid e Kilan is set up during Friday prayers by Quetta Working Committee for the correspondence with momineens. In this trip, C.C also met Molana Maqsod Domki of MWM during which different issues of Baluchistan came under discussion. CC also visited Central Branch of Al Mustafa School where they met honorable Professor Taj, Board of trustee, and honorable Principal Ms Riffat was also present in the meeting whom afterwards provided a visit of their school and also introduced their students. There are nine branches of Al Mustafa School in Quetta. Most of the children�s of families of Shohada study in these schools from whom the school administration does not charges fees. The book Tareeq e Shohada (Dera Ismail Khan) Part 1 was published two years ago and now its part 2 will be published soon. 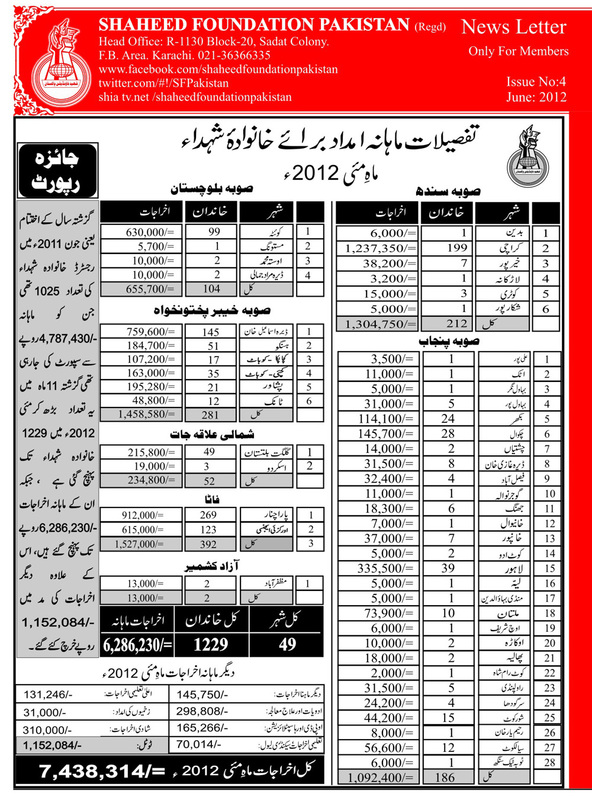 Beside it, work on books over Shohada e Bahawalpur, Shohada e Kohat, Shohada e Okara, Shohada e Kacha Pakka and Shohada e Karachi is in process. 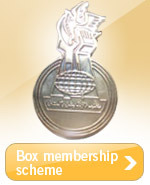 It has been emphasized to the Working Committees of the rest of cities to work on this project. D.I.KHAN : TREATMENT OF INCURABLE DISEASE. A family of Dera Ismail Khan, inflicted with an incurable disease, was given medical treatment at Lahore who was not able to bear heavy expenses for the treatment. Two young sons and one daughter of Shaheed faced a critical problem that their legs failed to move without any precautionary symptoms. After the treatment at Lahore all three of them are now able to walk and are gradually recovering. Till now, Rs.550,000 of expenses has been spent on their treatment. Al Shaheed Welfare Pakistan: an injured of incident at Karbala Gamay Shah(Lahore) whose both legs were damage and detached was given Rs.70,000 to get artificial legs. Our permanent readers might remember that last year seven injured Momineen of D.I Khan were assisted financially to start business. 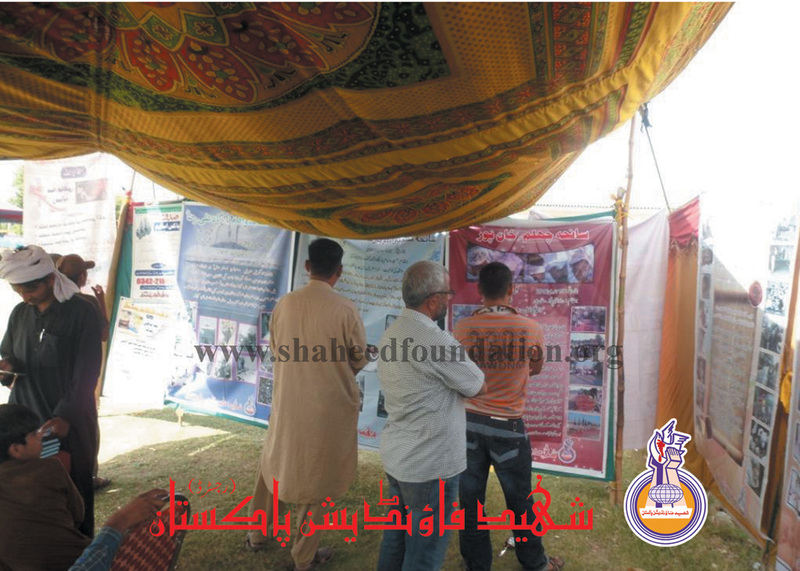 Karachi: On 5 May 2012, Anjuman e Zarb e Haideri Karachi organized Shohada Day in which a stall of Pictoral Exhibition and Al Shaheed productions was set up. Karachi: On 30 May 2012, on the occasion of Shohada Conference for barsi of Shohada of Masjid e Haidri & Imam Bargah Ali Raza a.s., SFP organized a Pictorial Exhibition. 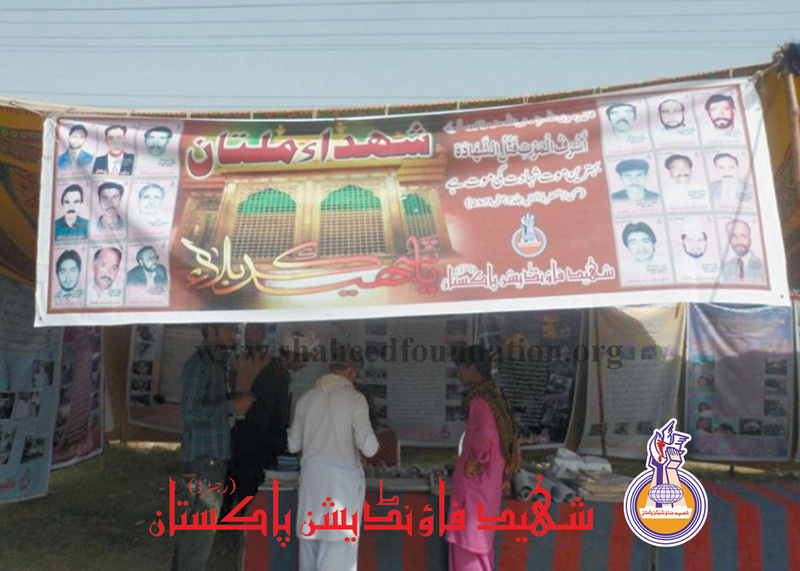 Multan: On 27 May 2012, in Quran o Ahlebait a.s Conference a stall of Pictorial Exhibition of SFP was installed.